Digitally tag different video takes with slate info (eg. description, scene) and identifying actors for easy preview. We are filmmakers who understand how difficult it is to preview videos of different takes (sometimes up to hundreds of videos). 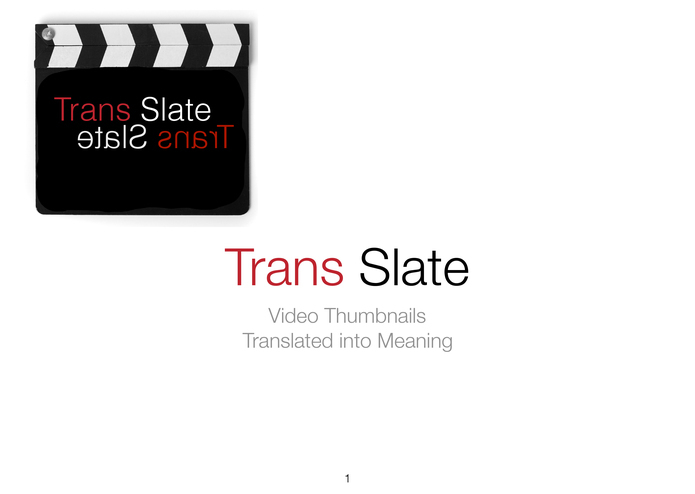 Trans Slate recognizes text on a handwritten/typed slate and digitally transcribes it into a graphic overlay on the thumbnails of each video. It also detects faces for further identification of talents and recognizes voice input of the quality of each take (eg. excellent, good, no good). We used Ziggeo API to create a recording app. We then detect frames that contain the slate information and transcribed it to text using Google Cloud API. Lastly, we built an image set of actors in the video and used Clarifai’s API to detect actors. Getting the different API to integrate together to work. Getting each API to work each step along the way. Reaching out to non-profits/government institutions and small businesses/solopreneurs who tend to have limited resources to engage professional filmmakers to produce marketing materials. Trans Slate is a simple and elegant solution to saving time and money during the production process. pain points I see my clients have. I created presentation and materials for the mock up. No coding. Victor did all the heavy lifting. Enjoyed going outside of my usual role as producer and filmmaker.